Upstate NY’s largest selection of Leather Fashions and Accessories, Motorcycle Apparel and Accessories, and Footwear at outlet prices. Shop for brand names including Minnetonka Sandals & Moccasin, Abilene Boots, Wolverine, Bates, Dunham, Work One, Throwgood Shoes, HJC, Shoei & Vega Helmets, Columbia Jones of NY, 9 West & Co., CHAPS, Timberland, Colebrook, Kenneth Cole, Tommy Hill, Guess, Samsonite, Tourmaster, Cortech, Sage & more! Designer leather briefcases, handbags & luggage. Leather: cell phone cases, fanny packs, coin cases, ID Holders, money belts, wallets, accessories, etc. Snakeskin & Alligator: wallets, key chains, bolo ties, belt buckles, rattles, stuffed snakes, gator heads, and more. 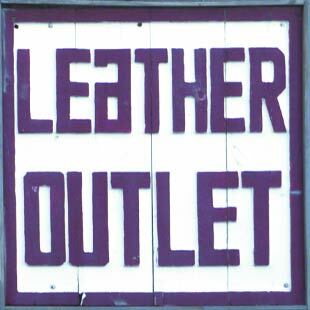 Leather Outlet is located 2 miles south of Lake George Village. 1/4 mile north of Outlet Malls. Next to the World Famous Tepee. Open Year Round.